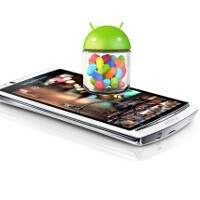 That Sony spokesperson who said that the 2011 crop of Android devices, like the popular Sony Ericsson Xperia arc, won't be upgraded to Android 4.1 Jelly Bean, was seemingly not authorized to speak by the mothership. During a Q&A session last week on our Sony Mobile GB Facebook page, a local spokesperson gave information out in error on our Android 4.1 Jelly Bean software development and rollout for 2011 Xperia smartphones. We are actively investigating Android OS upgrades for all devices, but in the meantime, our Ice Cream Sandwich rollout for Xperia S and 2011 Xperia smartphones continues as planned. "Yay for misspeaking, there's still hope! ", said the trusty Xperia arc in your pocket, and arched its back further so you can scratch and pet it with delight. Yeah Sony is stepping up & making some really great products. I can't wait for a Cybershot camera on one of their Xperia phones already. C'mon Sony deliver already. You know what, I am going to hold out just to see what these new Windows 8 tablets are all about. I want to give Microsoft a chance to show me something new & fresh if not, then too bad for Microsoft. The only thing I will buy from Microsoft will be the new Xbox 720. That is about it, unless their Windows 8 tablets are some serious machines that is. Is there gonna be a Cyber-shot on one of the upcoming Xperia? I'm plannin to buy an Xperia in September, not sure if I should get the Xperia S, since Galaxy S3 and iPhone 4s already showed better camera photoes according to some internet reviews.. I am not sure but if I were a Sony executive I would be running this by everyone I could. I think it's a win, win! Let's HOPE for the best. Xperia Play won't get ics and (probably) won't get JB. It's the only 2011 phone that wasn't updated and there is a reason for that. Apparently gaming performance on the xPlay degraded with ICS, and you know, it's supposed to be a gaming device. That's why sony decided to play safe and stay with gingerbread. On the other hand I'm pretty sure there are some unofficial ICS roms for the play in xda-developers. Yeh, my arc could be getting JB! Sony has been on a roll lately. They're really being aggressive in the mobile game. Unfortunately, Android users are so spec obsessed that they don't even usually give Sony phones a 2nd thought just because it's not quad core or has some ridiculously large screen. I mean, what good are specs if your phone can't even run the latest build of Android unless you root it.? Yes!!! At least I know that theres a chance that my xperia ray could get JB!